The Catholic Church has long honored early Christian leaders, theologians and teachers from the East (Greek) and West (Latin) as Fathers of the Church. 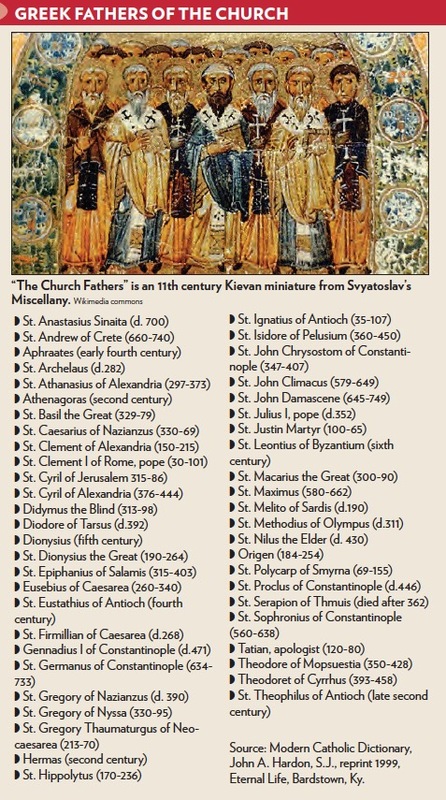 Unlike Doctors of the Church, there is no official list of Church Fathers. Over the centuries, lists with many similar names have evolved, and dependent upon the source, there are sometimes an excess of 100 individuals identified as a Father of the Church. In the fifth century, St. Vincent of Lerins came up with criteria associated with selection of a Church Father: live in the period known as antiquity (which is considered from the first to the eighth centuries), live a holy life, ascribe to and promote the orthodox Christian teachings, and receive Church approval. 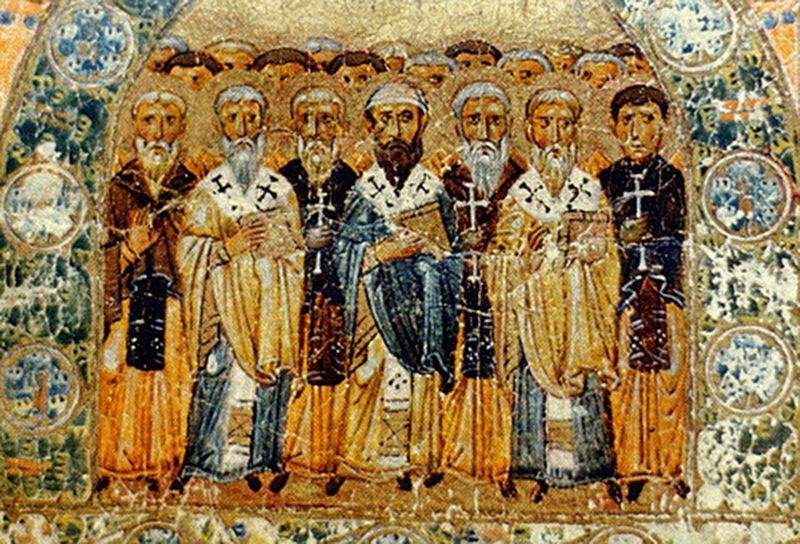 In reviewing the Church Fathers, they are generally categorized by the era in which they lived: Apostolic Fathers are those who knew the apostles; second and third century Fathers (Ante-Nicean) are those who lived before the great Council of Nicea in A.D. 325; Nicea Fathers lived during the time of the Council; and finally, Post-Nicea Fathers are those from the Council until the eighth century. This article discusses some of the Greek Church Fathers, and those singled out are intended to be representative of the holiness, courage and wisdom all the Fathers possessed. These men were willing to die if necessary, and many did, rather than deny their Savior or his Gospel. They are the stepping stones to our Catholic Christian faith, models to everyone calling themselves followers of Christ. Living in the mid-first century, Clement was third in succession to the throne of St. Peter, the papacy. Historians have concluded that he knew Peter and Paul; following their martyrdom, he became a Church leader and was eventually selected as the pope (r. A.D. 88-97). Only one writing from Pope St. Clement, authored around the year 96, has survived; it is a letter to the Christians at Corinth. This letter is not unlike the letters that St. Paul wrote to those Christians and in fact is titled: Letter to the Corinthians. In his own words Clement echoes similar concerns that Paul also addressed, concerns that could divide the Church and the Corinthians. Clement rebuked a small group in Corinth who had abolished certain elders from the Church. He wrote, “So they who were of no renown, lifted up themselves against the honorable; those of no reputation, against those who in respect: the foolish against the wise; the young against the aged.” The upstarts were, intentional or not, ridding the Church of those who had been appointed by St. Paul. The bigger issue was the potential disunity such actions could cause. Clement advocated peace, love and reconciliation as taught by Jesus and reiterated by St. Paul. There is evidence that Clement’s letter was read in all the churches, emphasizing the need for unity, a unity that, underscored by humility and love, even today sustains the Church. It is believed that Clement was drowned by Emperor Trajan in the year 101. St. Ignatius purportedly was a disciple of the Apostle John and appointed second bishop of Antioch after St. Peter. Ignatius reigned as bishop for 40 years, spreading the message of Jesus and the apostles. There is not a lot of information about his life, but he held the Church together during the brutal second-century persecutions of the Roman Emperor Domitian. In the year 107 he was seized by the Romans and condemned to death because he refused to sacrifice to the emperor or deny Christ. Arrested in Antioch, he was put in chains and transported to Rome, where he would be executed by wild beasts. In route to Rome, he wrote seven letters addressed to many of the Christian communities. These letters encouraged all Christians to remain focused on the original and divine teachings of the apostles, emphasizing the importance of unity, the need to stay obedient to their bishop and away from the heretical elements that were penetrating and would attack the Church. Ignatius would not be the last leader to proclaim the need for Church unity. To the Smyrnaean community he wrote: “Whenever the bishop appears, let the people be here; just as wherever Jesus Christ is, there is the Catholic Church.” This was the first time the term Catholic Church was used in Christian writing. He possessed an elevated status among Christians of his time because he knew the apostles and his teachings were considered orthodox and authentic. His widespread influence was not lost on pagan Rome. He was arrested and brought before the Roman proconsul. When Polycarp refused to make a sacrifice, take an oath to the emperor and deny Christ, he was threatened with being fed to wild beasts. When he showed no fear, the proconsul instead threatened to burn him alive. When he was bound and set on fire, the flames miraculously did not consume him. Then the Romans drove a sword through his heart. St. Justin converted to Christianity when he was 30. While he considered himself a philosopher, he would become the most important apologist of the second century. Living in Rome, as the head of a school of philosophy, he concluded that the pagan Romans misunderstood Christians and erroneously accused them (Christians) of being enemies of the state, criminals and cannibals. Christian worship was regarded as a secret, mysterious affair involving cannibalism. Justin addressed this misunderstanding, spelling out what happened during the Christian Sunday celebration or Eucharist. His description has a remarkable similarity to the Mass today (see sidebar). Justin also wrote a letter to the Roman Senate, describing the Christian faith as nonthreatening. His words had seemingly no impact. He was martyred in 165. Historians often refer to the next category of Church Fathers as the Ante-Nicean Fathers, those after the Apostolic Fathers and before the fourth-century Council of Nicea. These dedicated philosophers and theologians began to develop and explain the basic doctrines and beliefs of Christianity. In the East, the greatest Father was Origen. Although not a canonized saint and in fact condemned by the Second Council of Constantinople, Origen is regarded as one of the great thinkers among the early Fathers. He authored over 2,000 different works in his lifetime, and it is difficult to name the most important work, as each one had great influence on Christian doctrine in the early Church. He prepared, during a 28-year period, a project called “Hexapla,” in which he compared, and harmonized, the Old Testament Hebrew texts and the four Greek texts including the Septuagint, which was the translation used by the Church. He arranged the Scriptures of the Old Testament in six columns, side by side; each column was the different translation of a passage. This was a 50-volume document and an analysis of the Scriptures that had never been done. Around 178, he wrote an apologetic text refuting the attack on Christianity by a pagan named Celsus. Among other falsehoods, Celsus claimed that Jesus was not born of a virgin, that there was no Resurrection, that Christians were some kind of secret pagan group, that the Scriptures they attested to are fictitious and that, while they could worship a supreme God, they should also worship local deities. Origen drew on the Scriptures to reject each of the false claims, doing so by categorizing the issues and, as he often did, analyzing them from a literal, moral and allegorical view. 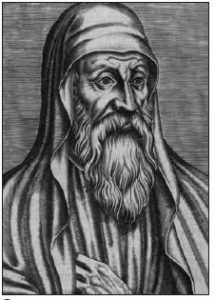 Not everything Origen discerned was accepted by the Church, although in some cases it appears he was surfacing issues for debate rather than espousing a belief. He did claim that even the devil could be saved and believed in the preexistence of souls, which resulted in his condemnation by the Church 200 years after his death. No matter these shortcomings, the profound works of Origen in content and number rival those of St. Augustine and provide the foundation for many doctrines of our Catholic faith. Sts. Athanasius, Cyril of Alexandria and Basil were among the Eastern Church Fathers who, during the era of the Council of Nicea, took on the worst of the idolatrous teachings and heresies of the fourth century. This struck at the heart of Christianity. Suddenly there were arguments between theologians and among the populace as to whether Jesus was divine, whether Jesus and God were the same. 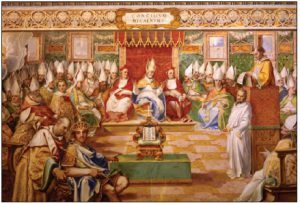 Sensing the potential for disunity within the Church and empire, Emperor Constantine (272-337) called for an Ecumenical Council at Nicea in 325 designed to settle the issue. Led by Bishop Alexander of Alexandria and his secretary Athanasius, the assembled bishops developed the Nicene Creed, clearly indicating that Jesus and God are of the same substance (consubstantial). Arius was deposed of his priestly duties and banished by Emperor Constantine. This was not, however, the end of the heresy. Arius had wide support from many Eastern bishops, and when Constantine died, his pro-Arian son became emperor and immediately began to enforce Arianism on everyone and removed use of the Creed from the churches. He pressured Athanasius to receive Arius back into the Church, and when Athanasius refused he was exiled to Egypt. Arius was welcomed back by the bishop in Constantinople, but while returning to be reinstated, he experienced some kind of severe seizure, and he died immediately. Athanasius spent his adult life opposing Arianism. Five times, 17 years total, he was exiled; even when accused of every type of crime including murder, he never backed down as the constant opponent to Arianism. Athanasius challenges the heretics, asking which of the Church Fathers favored Arianism. He said the Arians only advocate was the devil, “for he alone is your father in such an apostasy. In the beginning he sowed you with the seeds of this impiety, and now he persuades you to slander the ecumenical council, because it committed to writing not your doctrines, but those which from the beginning were handed down by those who were eye-witnesses and ministers of the Word” (Letter Concerning the Decrees of The Council of Nicea, A.D. 350). It was largely because of Athanasius that Arianism did not get a longstanding foothold in the Catholic faith. When Athanasius died in 373, Arianism still threatened Christianity; the fight against the heretics was carried on by Basil of Caesarea. Arianism was arguably the greatest threat to the Catholic faith until the 15th-century Protestant Reformation. St. Basil received the highest honors of the Church: sainthood, Father and Doctor of the Church, Father of Eastern Monasticism, and named the “Great” for his role as bishop. From a family of five saints and three bishops (three Fathers of the Church) he was the perfect person to carry on the fight against the various forms of Arianism, including Macedonianism, which denied the divinity of the Holy Spirit. This denial had evolved since Nicea, not unlike many unorthodox beliefs of the Arians. It was the tradition then as now, that baptism was not valid unless those exact words were spoken. Basil’s defense against Arianism in all forms, including the heretics’ effort to diminish or even ignore the Holy Spirit, was a major factor during the First Council of Constantinople in 381, at which Arius was again condemned, the role of the Holy Spirit defined and even elevated in an expanded version of the Nicene Creed (the Nicene-Constantinopolitan Creed). Around the year 428, Nestorius, the bishop of Constantinople, began to preach that Jesus was two persons, one human and one divine. Thus, according to Nestorius, Mary gave birth to a human and accordingly, could only be the mother of Jesus, not the mother of God. When St. Cyril of Alexandria heard about these false doctrines, he immediately reminded Nestorius of the Church teaching, as confirmed at the Council of Nicea, that Jesus was one person, equal to the Father, and Mary was the Mother of God. Nestorius was not impressed, rebutted Cyril’s letter and continued advocating that God always existed and could not be born of a woman. Cyril notified Pope Celestine, who advised Nestorius to stop his teachings, recant what he had said or be excommunicated. Nestorius convinced Emperor Theodosius to call an ecumenical council so he, Nestorius, could explain his position. Eventually the Fourth Ecumenical Council was held in Ephesus, Turkey, in June of 431. Here Nestorius was declared a heretic and excommunicated, and Mary was declared the Mother of God (Theotokos). Cyril was bishop of the prestigious and influential Church of Alexandria for 32 years, and as such always in a leadership role in the East and maintained close continuity with the West. His commentaries defended the Holy Trinity against the radical teaching of both Nestorius and Arius. He was noted for his charity toward others, establishing hospitals, poor houses and hostels.